Well so far my little holiday from work has been just lovely. On Saturday I woke up and spent the morning lounging in bed, looking up exhibition listings, chatting on skype with a friend who is currently living in Japan, and catching up on a few blogs. I got the train at 1pm to London Bridge which looked completely different to how I had left it just over a year ago. I got the tube to Green Park and stumbled past the glamorous shops, slipping past the couples carrying huge patent bags filled with new treasures and nipped into see some of Paul McCarthy’s work at Hauser & Wirth. The exhibition had a great sense of space and I loved the occupation of the central piece, and the track which the viewer had to follow. However McCarthy’s work is not really to my taste (not because the work is completely tasteless, but because his sculptural talents could be put to better use). Next on my list was Sylvia Plath’s exhibition at The Mayor Gallery. It was just brilliant, I can’t even describe it properly. Tucked away in the backroom of the gallery, Plath’s framed pieces lined bare walls and had more presence than any part of McCarthy’s installation. Simple egg-shell cartridge paper with pencil marks traced with ink. The highlight of the exhibition was a framed poem, typed up by Plath herself. Her address was printed on the top right-hand corner and the rusty, flaked remains of a paperclip long-since disregarded marked the top left-hand corner. I stood one metre from the framed fragment of her life, and could not believe that I was staring at a piece of paper which Plath had typed on. This wasn’t a print, this wasn’t a copy, this was the original and I could sense it. I stepped back and walked straight out of the gallery with shaking legs and a foggy heart, and stupidly walked straight into Burlington Arcade. The mall was packed to the brim with tourists and felt like it stretched on for miles before I finally reached the end and rushed straight into Costa to guzzle a latte and some peace. Once I had caught my breath I crossed a few streets and arrived at Whole Foods. 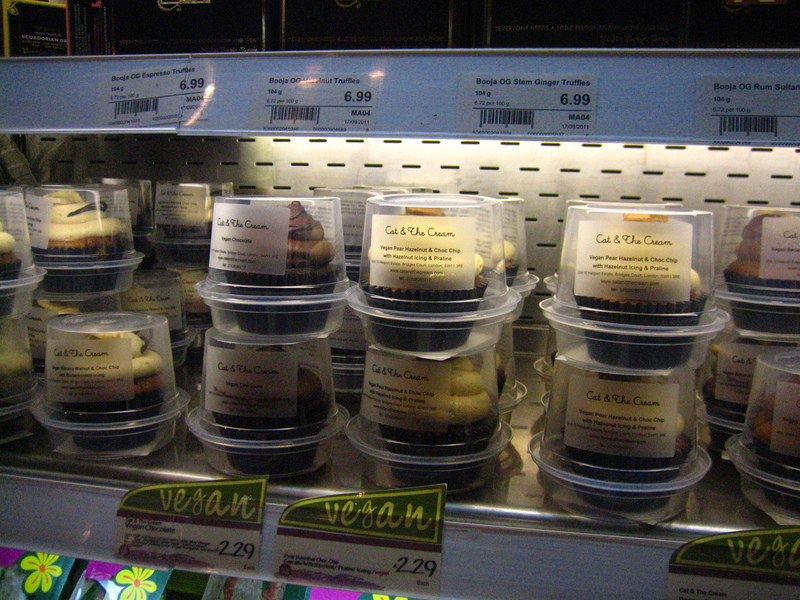 I was so pleased to see a whole shelf in the chiller dedicated to vegan cupcakes, cheesecakes, tortes and other sweet treats! How brilliant! Next on my list was the Wellcome Collection, one of my favourite museums. The current show focuses on Mexican miracle paintings, where people give thanks for the wonderful things which have happened to them; usually occasions where an illness has been cured. There was also a wonderful display of prayers where people had written letters and stuck up clothing or significant objects and asked for help in their lives. The exhibition was brilliant as ever, but I didn’t enjoy it as much as some of the previous shows which I’ve seen at the Wellcome Collection. Suddenly it was time to dash across to Kings Cross for some early supper at Itadaki Zen. The restaurant is very sweet with a handful of tables, decorated with jars of pickled pears and literature. 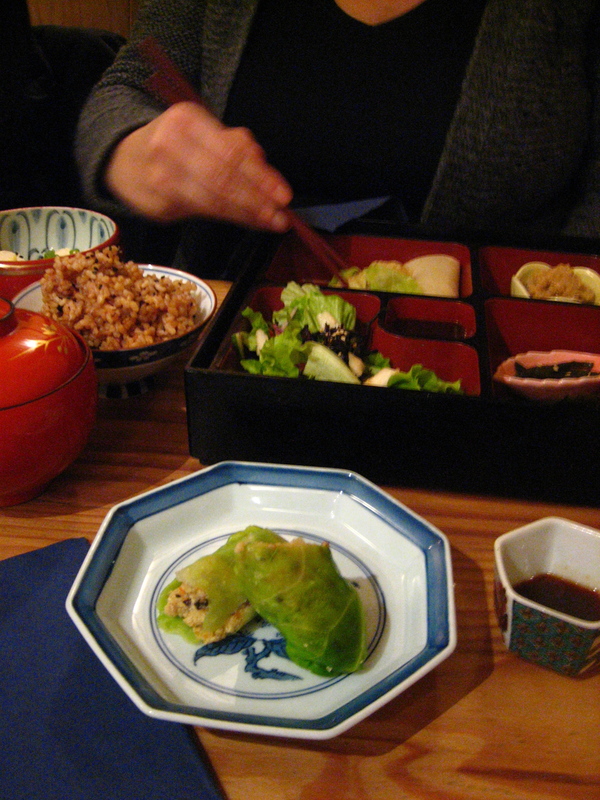 The food was just as simple, with brilliantly subtle flavours and a variety of japanese dishes and combinations. Unfortunately I only managed to snap a photograph of the Ryokusaimaki which I ordered; this was a boiled cabbage leaf filled with finely ground veggies. Delicious. I also ordered a combination of two sushi choices- one with shitake mushroom, the second with wild garlic. I love sushi, it’s so simple but deliciously satisfying. I should have ordered some miso soup too. On Sunday a friend came down from London to stay for a couple of days, and we have been drinking mulled wine, eating huge bowlfuls of mushroom risotto, watching movies, looking at artwork and drinking coffee. Today I went to a local college to have my haircut, which was an experience! At £7 for a haircut, I was seeking a simple trim which was exactly what I got! I felt very much like a prop but came away with all the frazzled ends gone and a sleek shine to my hair. I think I will go back and explore the other options which they offer; perhaps a manicure or massage? After lunch I ducked into Iydea for a late lunch, and had a plate piled high with delicious salads. Coleslaw, beetroot, marinated tomatoes, sprouts, houmous and lettuce. I love this cafe, everything that they dish up is so fresh and full of flavour, and with such a confident awareness of vegan options and availability they always have something on the menu to tempt me, whether it is for breakfast, brunch, lunch or some afternoon sweetness. I hope everyone has had a brilliant start to the week and has started their Christmas shopping! Don’t get stressed by it all, which is what I usually end up doing – I’m starting early this year! A day of going to museums sounds lovely. I need to do that soon. I think its better to go to museums alone anyway. Everyone has different interests and i love being able to explore on my own without being dragged to certain exhibitions by other people. You would be good company though :) I’m not a big fan of instillation sculptures either. I guess it depends who you go with.